Has your local sports club got a defibrillator? In August 2018, a fifteen-year-old boy collapsed in a local sports class at his school due to a cardiac arrest. His father was on hand to help by using a defibrillator, which more than likely saved his life. Defib Machines know how important it is to have an AED on hand in any public space, as cardiac arrests and heart attacks do not discriminate – they can hit anyone at any time. Luckily, the teenager was able to make a full recovery, but had there not been a defibrillator on site the outcome may have been very different. Within minutes after his attack, the teenager’s father, who had campaigned to have the defibrillator machine installed, was able to easily use the AED and save his son’s life. According to the BBC, the arrest was due to a coronary artery being too narrow which meant there wasn’t enough oxygen getting to his heart when he was exercising. Naturally most people tend to be nervous or apprehensive when it comes to using medical equipment traditionally reserved for qualified use only. However, it has never been easier to administer life saving actions as a defibrillator already comes equipped with instructions on how to use it. If you’re still nervous, we offer complete training with each installation of an AED, as well as providing an instructional DVD for your staff to watch at their own discretion. Upon use, the machine itself will relay instructions verbally as well as having a clear diagram on how to administer the shock. In most cases, performing cpr is a matter of pressing a button. The machine itself will detect an irregularity in the heart’s beats and will provide a shock only when the AED deems it necessary. It isn’t a requirement to know how to use a defibrillator in detail, but using one on a victim of cardiac arrest is of upmost importance. Why does your sports club need a defibrillator? On average, the survival rate for someone who has suffered from a Sudden Cardiac Arrest (SCA) reduces by 10% for every minute they go without treatment. In recent figures released by the BHF, defibs are used in less than 3% of out-of-hospital SCAs. It has never been more important for public areas, such as sports clubs to have an easily accessible AED on site. Installing a defibrillator at your sports club doesn’t have to leave you out of pocket. 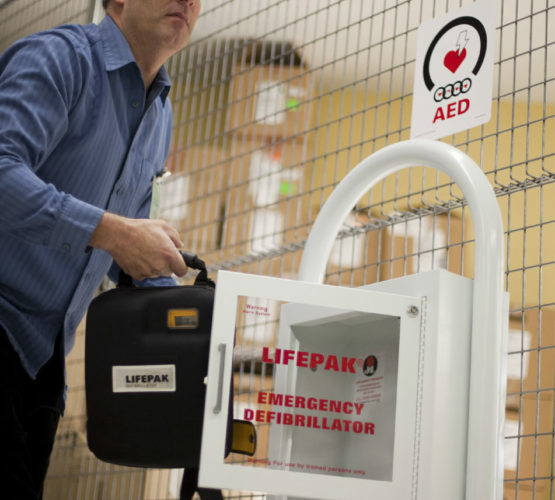 Defib Machines have rental offers from just £1 a day and includes training, installation, maintenance, replacement scheme and an orientation DVD. Find out more about the Heartsine Automatic Defibrillator here. For any questions, or if you would like further information about any of our AEDs then please get in touch with us on 0800 0852 733, or alternatively contact us online and an expert will get back to you as soon as possible.